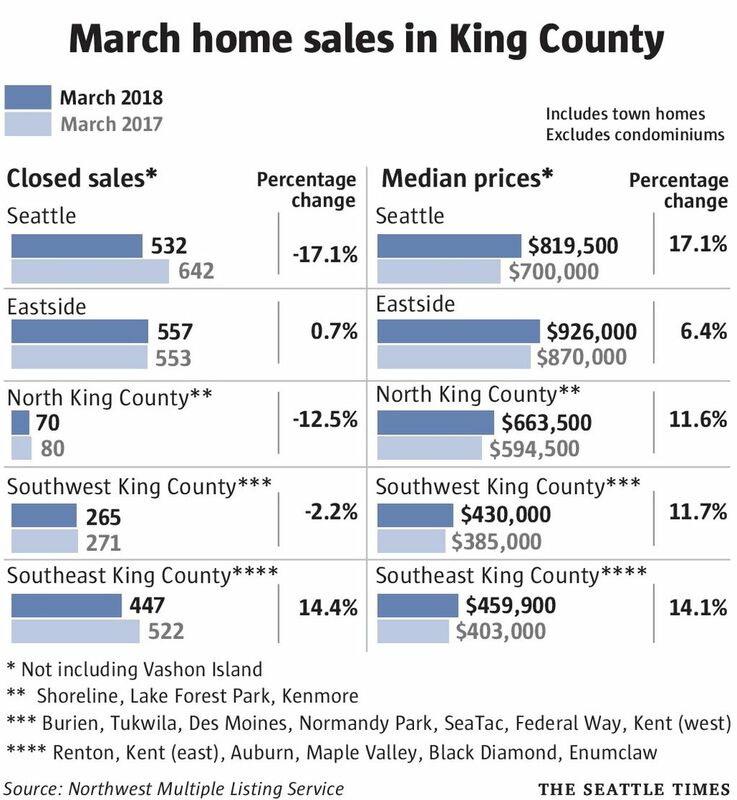 Every neighborhood in King County has seen home costs balloon since the region’s real-estate market first started to catch fire six years ago. But the rise hasn’t been completely even. In the first three months of 2012, the cost of a typical home in Southwest Seattle, which includes Sodo and Beacon Hill, was $222,000. In the first few months of this year? $661,000. In Southeast Seattle, which includes Rainier Valley and Mount Baker, home costs have grown from $275,000 to $650,000 during that span. In all, home prices nearly tripled in some southern neighborhoods since the bottom of the recession, while home values in the pricier central and northern parts of the city roughly doubled. The figures come from the Northwest Multiple Listing Service, which on Thursday released its latest monthly home-sales report showing the region’s homebuying market has, yet again, gotten even hotter. Citywide, Seattle home prices topped $800,000 for the first time. The median cost of a single-family house, now just under $820,000, smashes the old record of $777,000, which was set just one month prior. South Seattle remains the most affordable option — if you can call it that — in the city. But median homes in South Seattle are now more expensive than the typical house in pricey cities like Boston, Washington, D.C., Miami and Denver. South Seattle homes are even 65 percent more expensive than they were right before the housing bubble burst a decade ago. 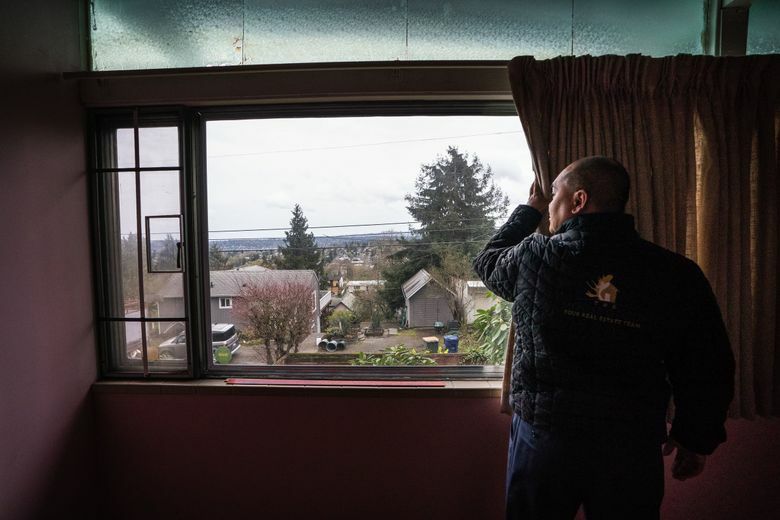 The housing market’s effects on South Seattle have been well-documented: The black population has plummeted, gentrification fears have grown and development has transformed neighborhoods. A big part of what’s been lost is the promise of an affordable home inside the city limits for working-class people. Six years ago, the household income required to afford a mortgage on a home in South Seattle was about $50,000; now, it’s about $130,000. “And even if they make that much, they’re still getting beat out, because the competition is so fierce. 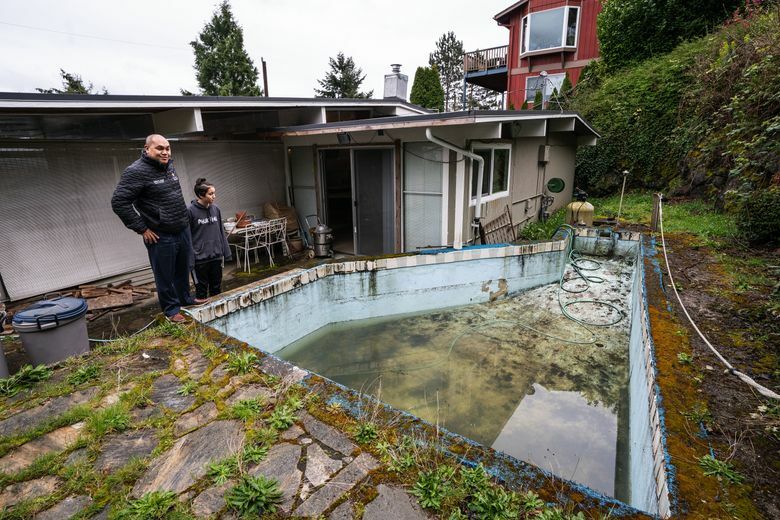 Every single time, we deal with multiple offers,” said Mustafa “Moose” Math of John L. Scott, who’s been a broker in South Seattle for 12 years. 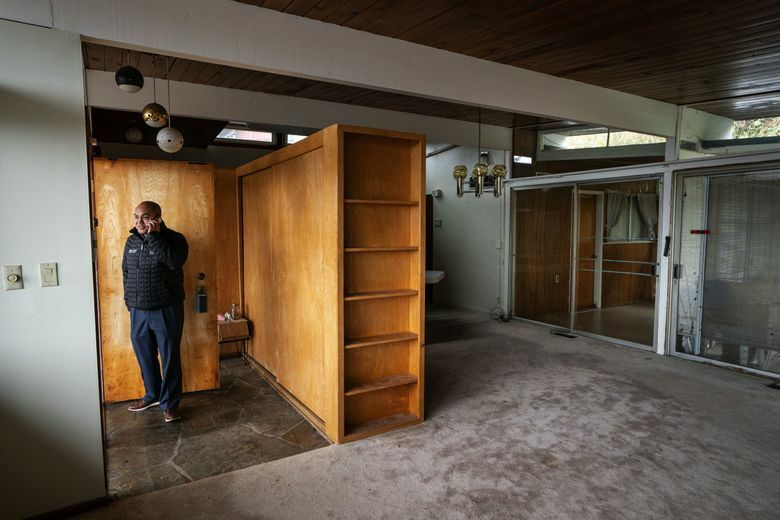 He recalled a buyer who just lost a bid on a South Seattle home listed at $849,000 — his client bid $920,000 but lost to someone who offered $1 million, including $80,000 in nonrefundable earnest money. Math said he’s noticed more young couples turning to South Seattle to get a single-family house as they prepare to have kids. Many buyers come down south after renting on Capitol Hill or the downtown area — places where people are less likely to have cars — and often want to be near the light-rail stations, he said. Zach Nostdal and his fiancée, who are expecting to start a family, bought a house in Rainier Beach at the southern tip of the city last summer for $426,000. 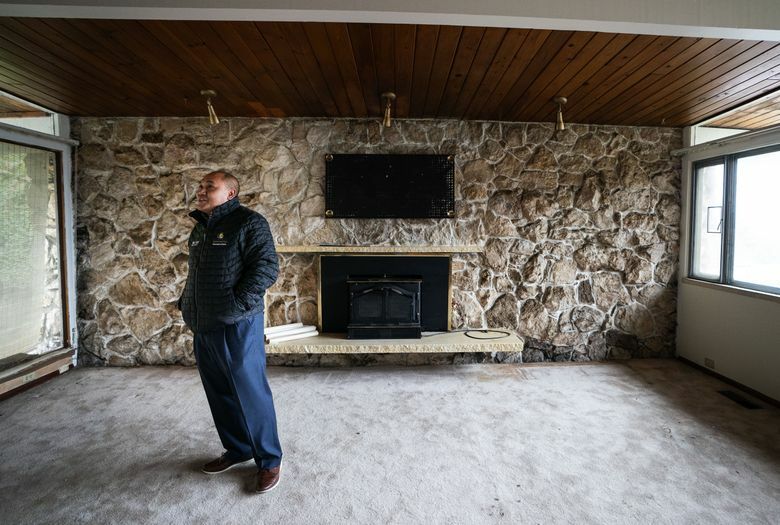 They had to pay $20,000 over asking for a house that still had rotting, moldy food in the fridge, but considered themselves lucky to only have one other person they were bidding against. A short while later, the house down the street sold for about $560,000, or $100,000 over the asking price. “Rainier Beach was just about the only neighborhood in Seattle we could buy a house in,” Nostdal said, adding that he also liked the idea of being near light rail. But that’s not an option available to everyone. Even as the down payment required to buy a home in South Seattle has increased by tens of thousands of dollars, it’s become harder to save up: Average apartment rents in the South End have hit $1,680, up from $1,070 six years prior, and have risen a bit faster than the regional average. 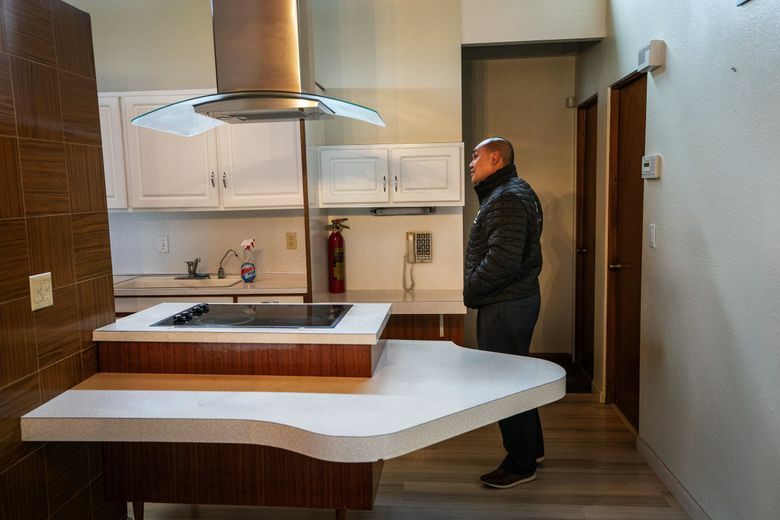 Clinton Parrilla grew up in South Seattle in a low-income household and, after graduating from Washington State University, moved back a couple years ago to find rents had escalated to $2,000 a month for a two-bedroom. He now rents a subsidized room in the area. At this rate, he says, he’ll probably never own a home there. Many of the people he grew up with, including some family members, have already been priced out. People who are priced out of the area often turn to the suburbs to the south — but there, again, is more bad news for buyers. 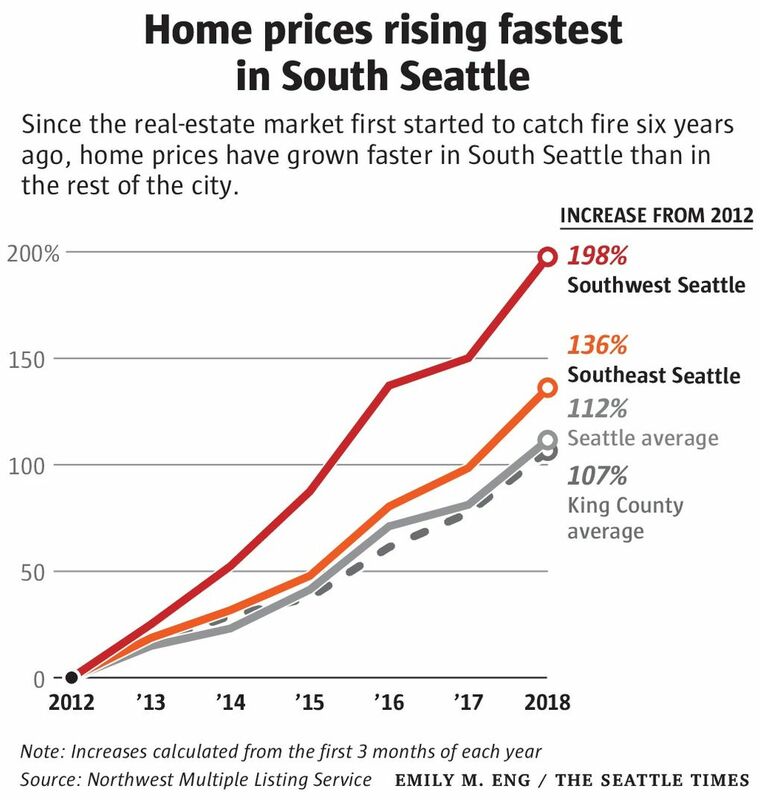 In Southwest King County, from Federal Way to Burien, median prices have grown even faster than in Seattle or the Eastside since 2012 and now sit at $430,000. That’s created a sort of domino effect where some people in South King County have moved toward Tacoma. The latest monthly market data, released Thursday, showed home prices in March continued to grow in King County and beyond. The region has led the nation in home price increases for the last 17 months in a row. King, Pierce and Kitsap counties all posted all-time highs last month for home prices. The Queen Anne/Magnolia area also had its priciest month ever. The typical home there sold for $1.275 million, just nine months after the area reached $1 million for the first time. 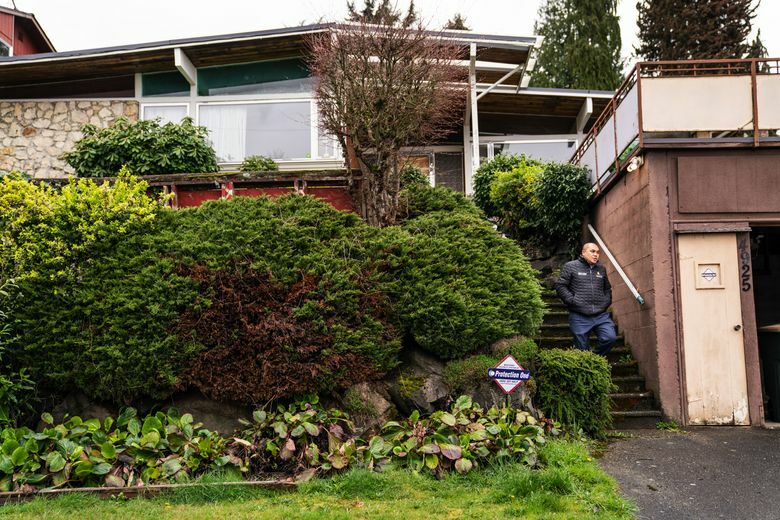 On the Eastside, the median home sold for $926,000 — that was up 6 percent from a year prior, but was down from the record-setting price of $950,000 reached last month. 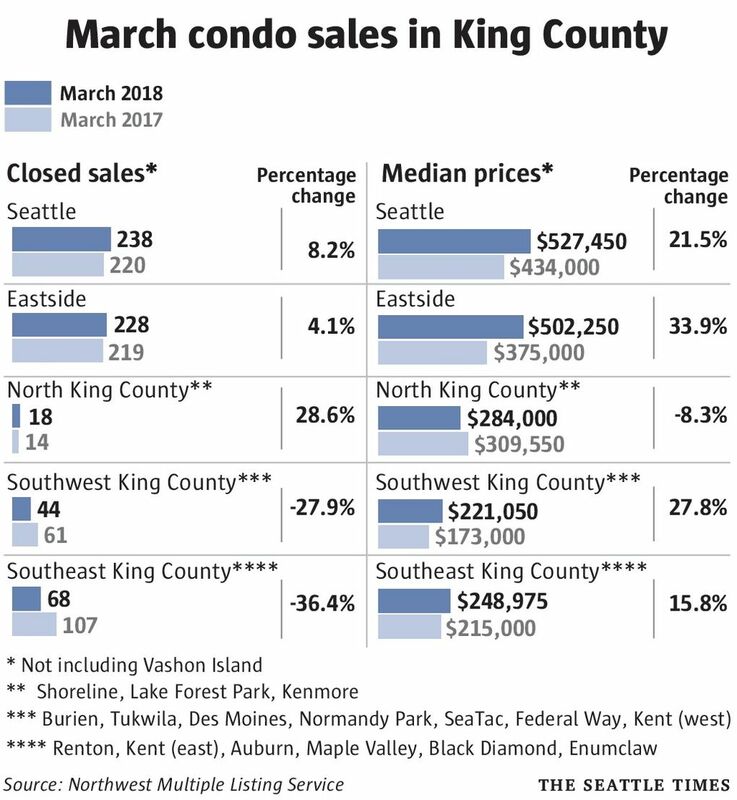 The number of homes for sale across King County dipped only a fraction of a percent after a half-decade of steep declines. Compared to a year ago, single-family-home prices grew 11.8 percent in Snohomish County, 18.6 percent in Pierce County and 18.5 percent in Kitsap County. 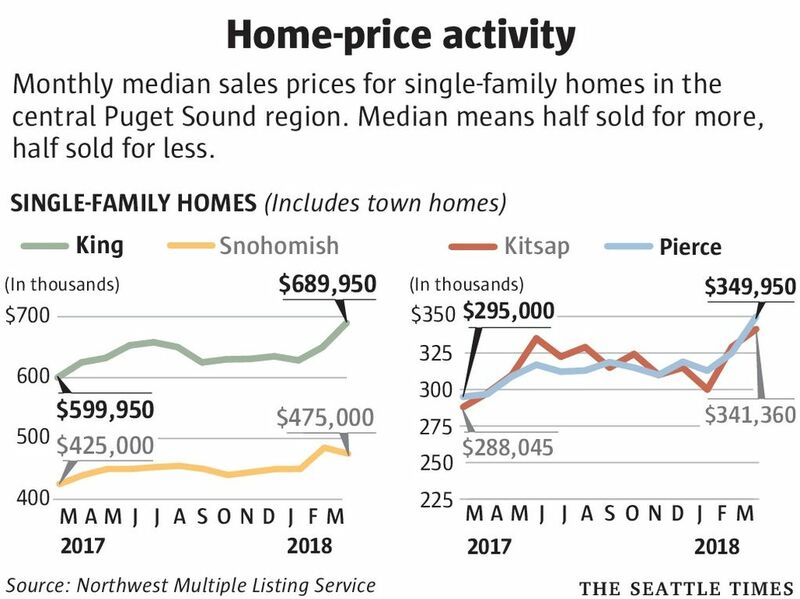 The median cost of a house hit $475,000 in Snohomish, $350,000 in Pierce (a record high) and $341,000 in Kitsap (also a record high). Condo prices rocketed up again, too. The typical condo in Seattle sold for $527,000 last month, up 22 percent in a year.